Lung nodules are masses of tissues found in the lungs. They are also referred to as pulmonary nodules. A spot that has a diameter of three centimeters or less is called a nodule. A larger spot is referred to as a mass and is treated differently when it is diagnosed and evaluated. Usually smaller nodules (1cm or less) indicate a higher survival chance if the nodule is cancerous. Lung nodules are usually benign or non-cancerous but some maybe malignant and lead to cancer. If a lung nodule is detected in a chest X-ray or CT scan, it is best to investigate the cause in order to rule out the possibility of the patient having lung cancer. 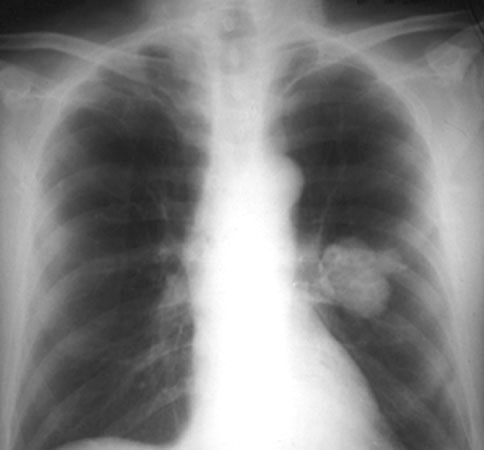 Lung nodules are usually round and appear like white shadows on a chest X-ray or computerized tomography (CT) scan. They can be about 1/5 inch to 1 inch, or 5 millimeters (mm) to 25 mm, in size. A larger lung nodule, such as one that is 25 mm or larger, is more likely to be cancerous than a smaller lung nodule. A benign pulmonary nodule does not go through much growth or change. Cancerous nodules on the other hand, tend to grow quickly. They may double their size every 25 days. A cancerous nodule appears as a sore that steadily spreads to more of the lung’s structures. This will eventually lead to shortness of breath, fatigue and chest pain. 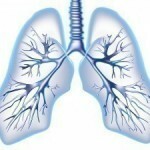 The main challenge with regard to lung nodules is that there are no definite symptoms to indicate their formation. 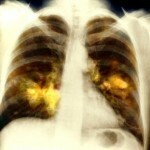 Most cases of lung nodules are detected by accident, when the patient does an X-ray or a CT scan. growth of the nodules: If the lung nodule is malignant or cancerous, the growth of the nodules will be rapid. They will grow and spread very quickly and this pattern can be detected using X-ray or CT scans. Benign nodules will undergo very little change or growth. calcification: The next factor that can be used to evaluate a lung nodule is to study its calcification. Observing the shape and surface of the nodule will help to determine the nature of the nodule. If it is smooth with regular shapes and an even color throughout its surface, it is most likely to be benign. If the nodules are shaped irregularly and have rough surfaces with color variations or speckled patterns, they are most likely to be cancerous or malignant. biopsy: Although X-rays and CT scans are reliable resources to study and diagnose lung nodules, the doctors may still choose to do a biopsy to completely rule out the threat of cancer. 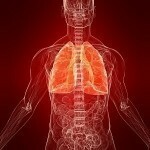 Non-cancerous or benign lung nodules usually do not require treatment. The malignant or cancerous lung nodules are treated according to their size, location and condition. They can be removed surgically.